Here you will find our picture archive and Lyse TV, in addition to press releases, contact information for press information and press photos. We have also made publications and presentations by Lyse available. 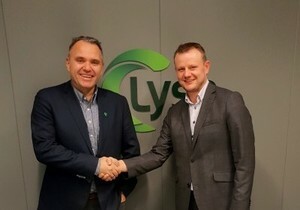 Lyse-group had in 2018 a profit after tax of NOK 1,1 billion. The underlying operating profit amounts to NOK 3,1 billion which is an improvement of NOK 1,2 billion compared to 2017. The results reflect a record-high hydropower production and solid operational performance in all business segments. Lyse have divested its remaining shareholding of 30% in Skangas AS to the Finnish stately owned company Gasum OY, which now owns 100% of the shares in Skangas. One of the world´s leading balance artists, Eskil Rønningsbakken, will perform at our stand to dramatize the role of hydro power in the future Europe. The Lyse group recorded a result of NOK 520 million during the first six months of 2018 compared with NOK 492 during the first half of last year. Altibox went against the grain, and increased its TV distribution in 2017. "Traditional TV content on the big screen is in good shape", says Chief Executive Offer at Altibox, Thomas Skjelbred. The Lyse Group had a profit of NOK 1.9 billion in 2017. Underlying operating profit is at the level of 2016 and reflects good operational activity in all the business areas. - The result reflects good underlying operations within the business areas energy, telecom and electricity grid, and the result is in line with our expectations, says CEO Eimund Nygaard. The Lyse Group had an operating profit the first half year of 1290 million, an increase of 420 million compared with last year. The half year result is characterised by high power production, stable growth within telecommunications and power grid operations with few interruptions. Revenue of 51 per cent of the gain on the sale of the LNG plant in Risavika contributes 219 million in operating profit. Lyse had a net profit of 708 million in 2015. Also last year was characterised by low power prices, and high production did not compensate for the drop in market prices for power. The telecom business area continues to grow, and has strengthened its market position also through last year. The smart city event, Nordic Edge Expo, in Stavanger, Norway continues to grow following its successful start last year. Microsoft Europe joins forces to make Nordic Edge Expo the meeting place for everyone involved in smart cities and smart technology. Representatives from the Fraunhofer Institute have for a week checked out Stavanger as a lighthouse city in the EU-funded smart city project Triangulum . – ‘Dugnad’ is a fine sum up word, they say. Innovation Norway launches its first FRAM Smart Cities initiative in Europe this week. Eight promising Norwegian technology companies are attending the first module in Barcelona, and five of them are from the Stavanger region.